Created by hand said: "Make a Christmas Tag" and I took the sketch of Tag you're it/Weekendtaggers for this week to create my tag. 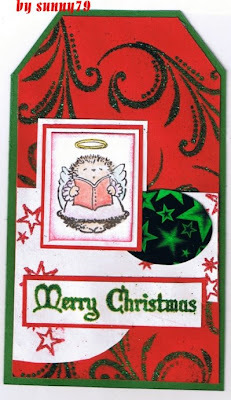 I used red and green glittering embossing powder but on my scan you can't see it, I'm sorry! This is a lovely christmas tag - what a sweet little image. Thanks for joining in with the challenge this week. Aww this is so cute - gorgeous vibrant colours and that wee Hedgie is adorable! Great tag for the upcoming Xmas season!! I can see the sparkle! Lovely tag!